(October 31, 2013)- Today at around 4:30 pm, a Cape Coral Police Department Traffic Homicide Investigator arrested William Siddons (W/M, 2-18-87) of 15893 Briar Cliff Lane, Fort Myers, Florida 33990. Blood results showed that Siddons had a blood alcohol concentration of 0.116 and 0.115 at the time of the traffic crash. 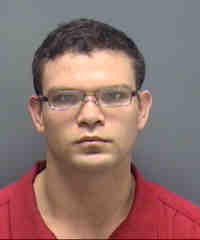 Siddons was also estimated to have been traveling in excess of 100 mph on Del Prado Boulevard. "Fatality crashes such as this are treated as and investigated like a homicide that occurs on the roadway. Our Traffic Homicide Investigators are meticulous and thorough in building these cases before an arrest is made, which can lead to a delay between the date that the crash occurred and the date an arrest is made. Our thoughts are with the family of Mr. Triguero. Hopefully, today's arrest helps them begin to close this tragic and painful chapter in their lives. "- Det. Sergeant Dana Coston, Cape Coral Police Department Public Affairs Officer.